The climate of Britain means that wind, rain and cold days are expected throughout the summer time. In 1998 Wotton Pool thwarted the weather with the installation of the retractable polycarbonate roof. This ‘greenhouse’ can be pulled away on warm sunny days, to bathe the bathers in sunshine and warmth. 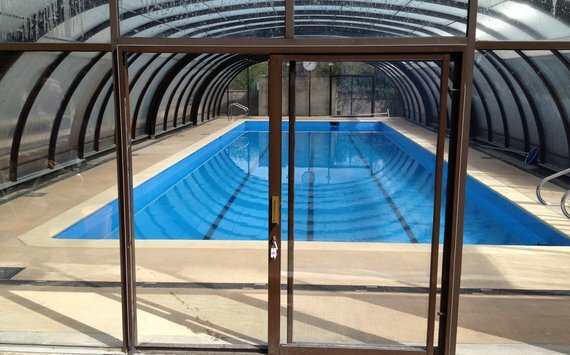 On cooler or wet days the cover provides perfect shelter from wind and un-chlorinated water, and has made swimming in the rain a viable option. In 2001 an off peak electrical heater was installed to supplement the solar panel; this has the effect of extending the season, and means that a minimum water temperature can be achieved, whatever the weather. In the last few years the faithful solar panel broke down, with the result that the pool’s heating was provided entirely by the previously supplementary atomic heating system. Unsurprisingly this caused a hefty annual electricity bill, and perhaps contributed to, along with nationwide funding cuts, Stroud District Council’s decision in 2010 to discontinue their involvement with the pool. However, as reported on other pages, a new company was set up in 2011 to run the pool, and had a very successful first season. So despite this set back, the future looks promising for the pool under the new management of Wotton-under-edge Swimming Pool Ltd., who hope to return the pool to its former glory and popularity.